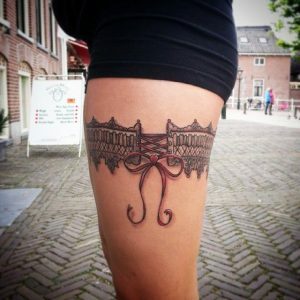 Anyhow, the fact remains that the tradition of tattooing was brought to the western culture and remained there as an embodiment of exoticism, orientalism and an object of mass interest in general. No need to remind that an important part of the development of any human society is one of the economic relations, so the profit side of the demonstration of exotic tattooed people soon became spotted by the most ready-witted, and with the small push of first tattooed aborigines from the overseas carefully transported and demonstrated in big cities, tattoo soon strengthened its presence in the sphere of entertainment (Atkinson 2003). Expectedly, tattoos found their use in circuses that were probably the only providers of “unusual” experiences and shows. The demonstration of men and women wearing full body “suits” became a popular attraction, which, in turn, served as a catalyst for general public interest in tattoos, even though in circuses and on carnivals it was generally perceived as a social deviance.